THIS LUXURIOUS SUITE HAS A PRIVATE PATH TAKING YOU TO YOUR OWN LARGE PATIO WITH DINING FOR TWO. THERE ARE MAGNIFICENT SEA VIEWS FROM BOTH THE LIVING ROOM AND BEDROOM. The apartment is furnished with a collection of art and designer furniture. Your bed choice is super-king size or super-twins. For cooler weather the bathroom floor is heated and your apartment has air conditioning and heating. There is a table for private breakfasts, a refrigerator and tea and coffee facilities. 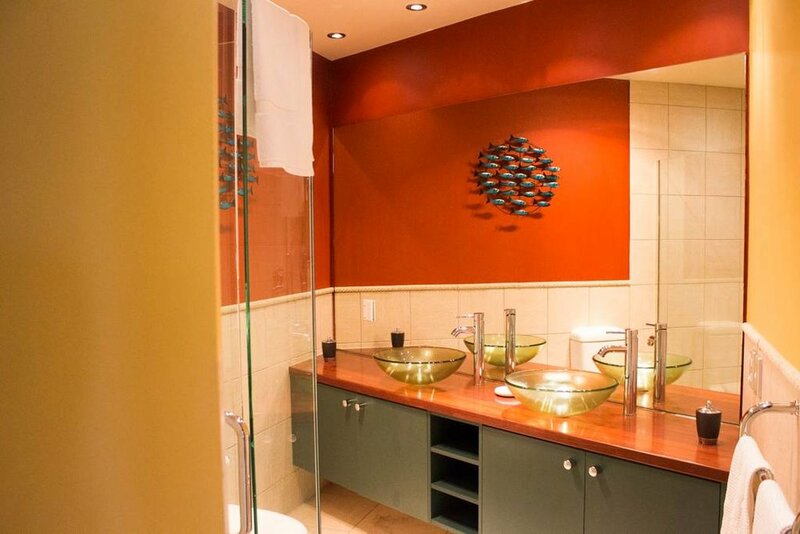 The ensuite bathroom has a shower, heated towel rack and glass double sinks. This is a room you will want to spend time in. Also TV/DVD/CD,air conditioning in the room, free wireless internet service available. A folding bed is available on request. “I really enjoyed my stay at Karen's place in Russell. Russell itself is a quaint, charming little town right on the water, and Karen's place is only a 10-15 minute walk (either on a beautiful protected dirt path through the bush or via the road) or a 3 minute drive into the town. 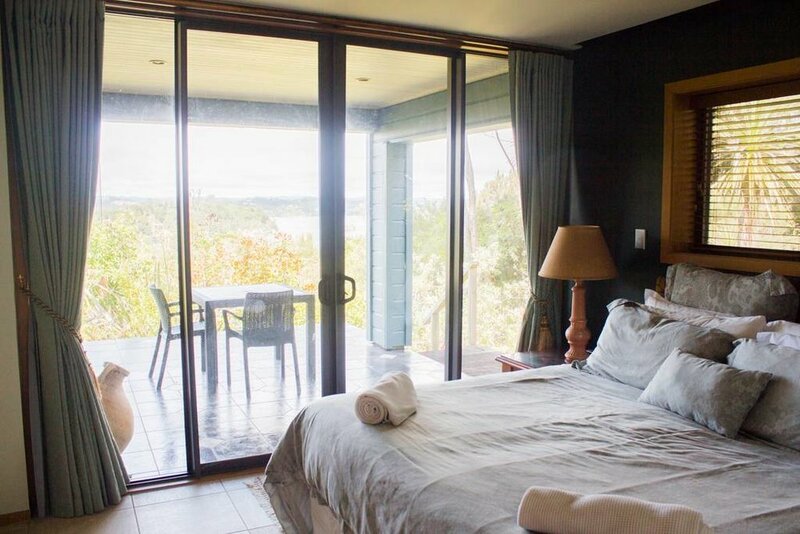 The apartment itself is private, self-contained, quiet and has a tremendous view of the bush, the bay, and of the town. The unit was clean and is plenty spacious for 1-2 people, and since I visited in the winter time, Karen was kind enough to turn the heat on before I arrived. She also provided me with some tips for things to see and do in the area. I enjoyed my stay here and would recommend it." "Karen’s place had an absolutely amazing view! She was very kind, making sure checkin was easy and smooth. The bathroom is beautiful and spacious which we really appreciated. There’s a scenic trail right next to the Airbnb that takes your directly into Russel that we used every day (about a 10 min walk). We would definitely come back! We fell in love with the town and the views."